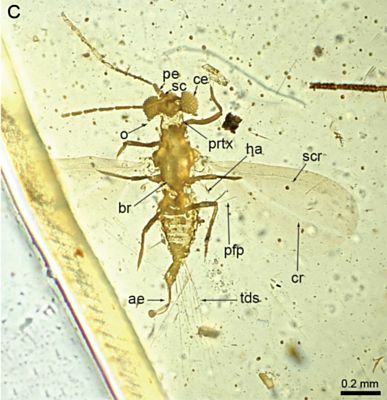 Holotype AMNH Bu-233a, alate male at the edge of a 10 Ã— 10 Ã— 1 mm subsquare, yellow, transparent polished amber piece, specimen in good condition, abdomen transparent, right wing truncated; accessible views: ventral and dorsal. Syninclusions in Bu-233 piece (subsequently separated) include the adult males of an undescribed Ortheziidae, buthid scorpion, and Acari. Myanmar, Kachin, Tanai Village, on Ledo Road, 105 km NW Myitkyna), Leeward Capitol Corp coll., deposited in the American Museum of Natural History.